Inventory We are a resale marketplace, not a box office or venue. Ticket prices may exceed face value. This site is not owned by Majestic Theatre Dallas . The Majestic Theatre Dallas is an iconic venue opening way back in 1921 and is still bringing in family shows and concerts to the local area. With a current seating capacity of 1,704 the theater was added to the National Register of Historic Places in 1977. 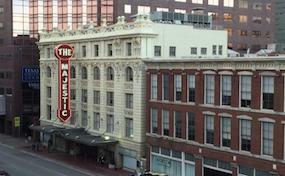 The Majestic Theatre box office is located at 1925 Elm Street in downtown Dallas, TX. The venue closed for a ten year period between 1973 and 1983. The Majestic Theater is all that is left of the once thriving Theater Row in Dallas. Majestic.TheatreDallas.com is an independently owned and operated company that specializes in the online retail for all secondary market events. All tickets may be above or below face value and can change at anytime. We are not affiliated with any official box office, web site, or supplier. To purchase tickets for all Majestic Theatre Dallas events simply click on the event of interest or call our operators at your convenience.